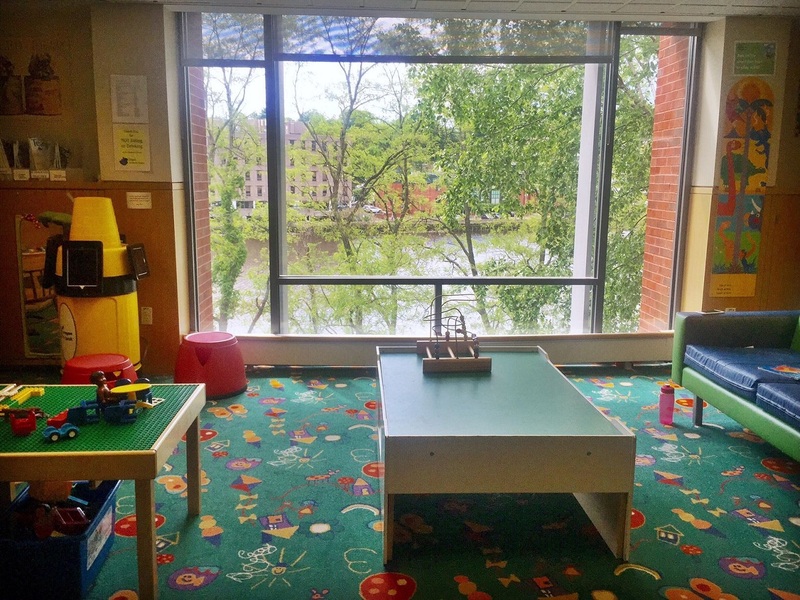 For 20 years, the River of Names has stood as one of the Westport Library‘most unique, quirky and popular attractions. 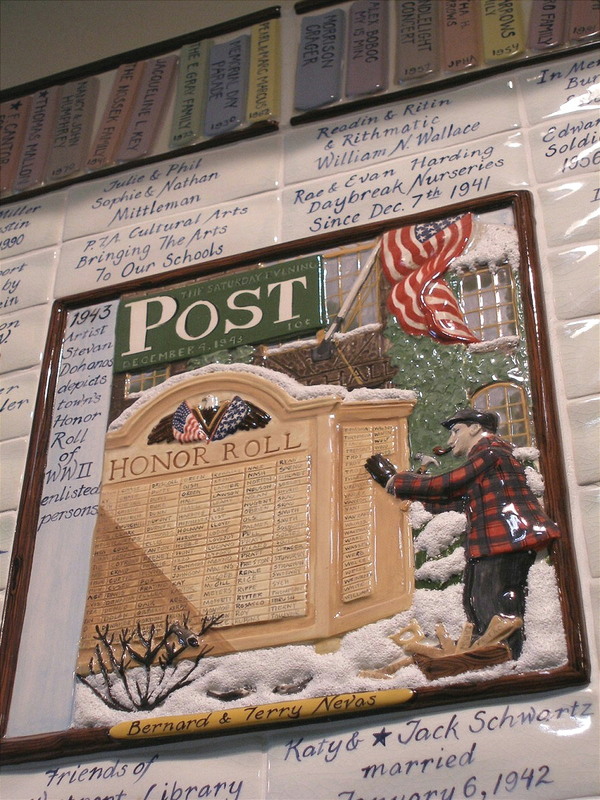 Stretching 26 feet long and standing 6 feet high, the mural contains 1,162 tiles. Each was individually created and drawn by artist Marion Grebow. Some portray historical events, like the founding of Westport, onion farming and the arrival of the railroad. Others feature favorite places around town: the Compo Beach cannons, Minute Man monument and Staples High School. Some cite local organizations and businesses. 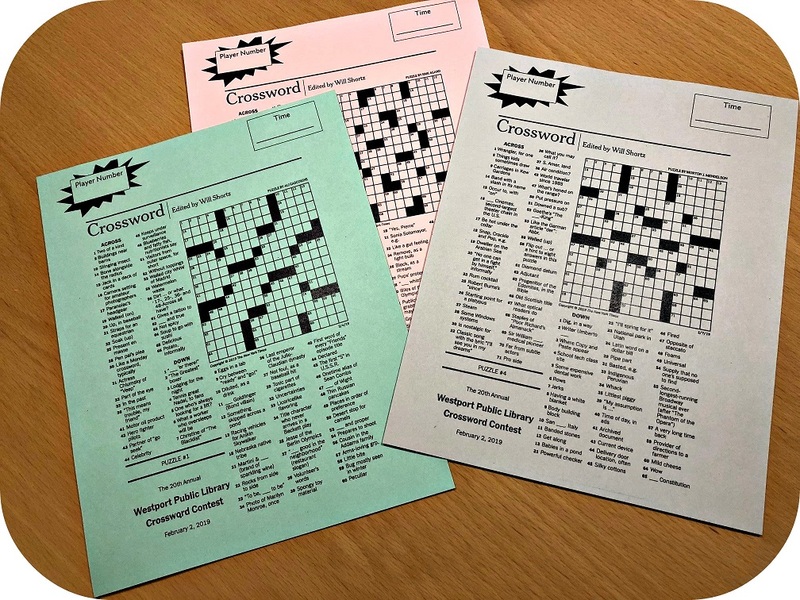 Most show the names of nearly 1,000 families. They honor parents, children and pets. They note when the families came to town, and where they lived. The River of Names was a special fundraiser. 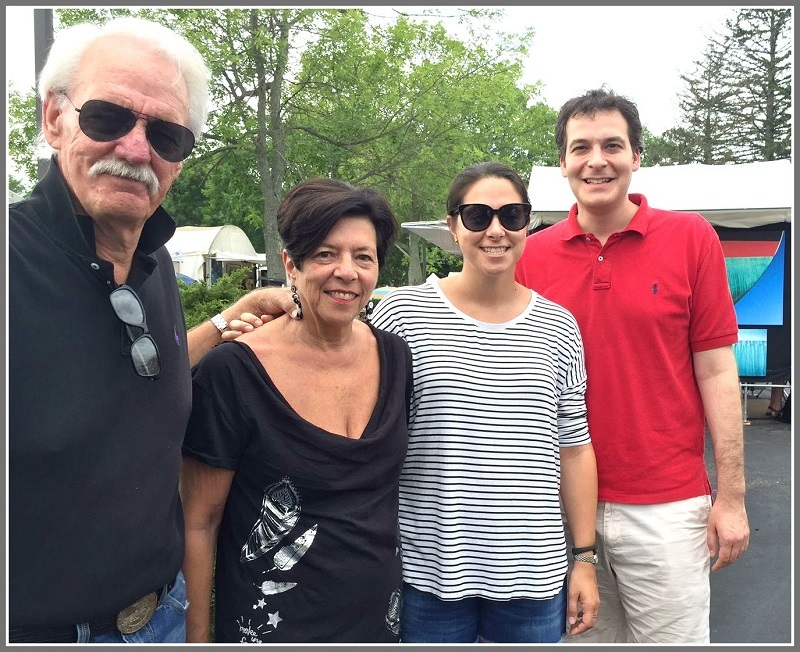 Under the direction of former 2nd selectman Betty Lou Cummings and Westport Historical Society/Westport Woman’s Club leader Dorothy Curran, sales of the tiles brought in $300,000 for the library’s capital campaign. 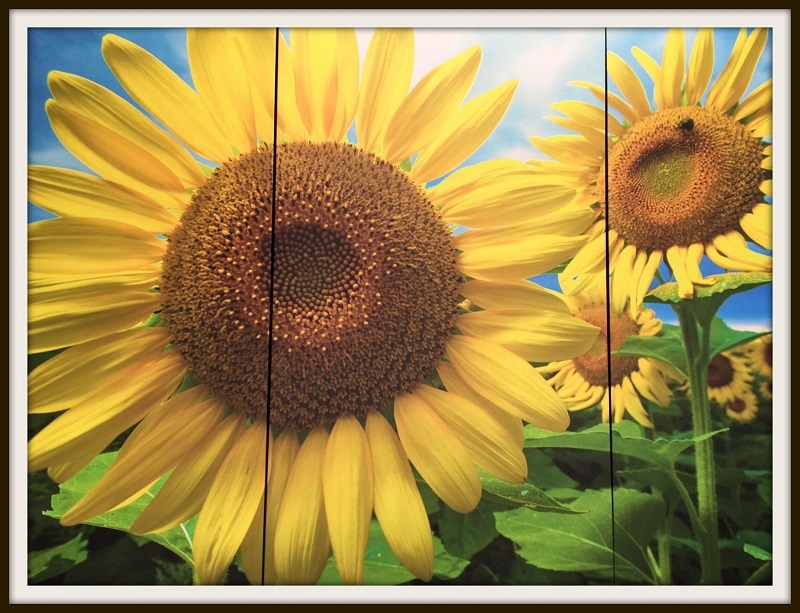 Donors were promised that the mural would exist in perpetuity. The River of Names draws visitors — some curious, some wanting to find their own tile, all intrigued — to the lower “Riverwalk” level of the library. Grebow designed her mural to be looked at like the river itself. Taken together, the individual tiles appear to shimmer and move — imitating the Saugatuck River a few yards away. 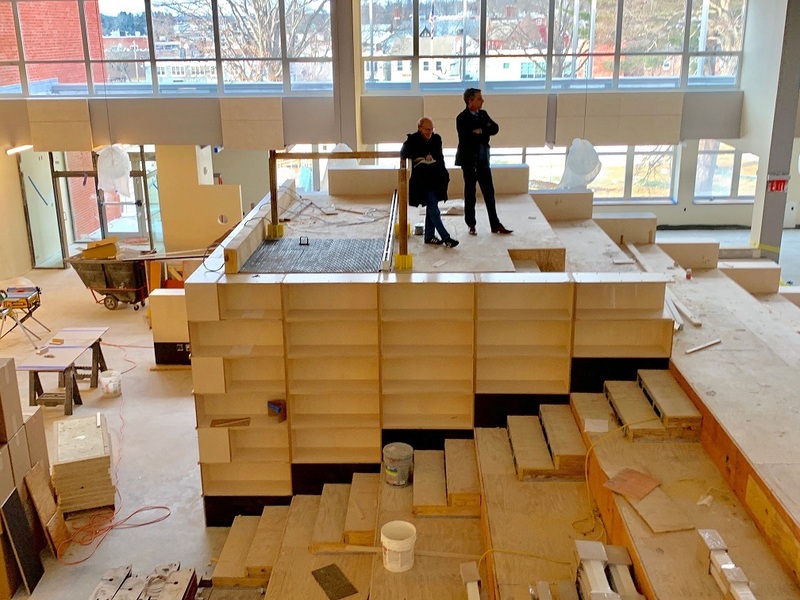 But the library has embarked on an exciting 18-month “transformation” project. 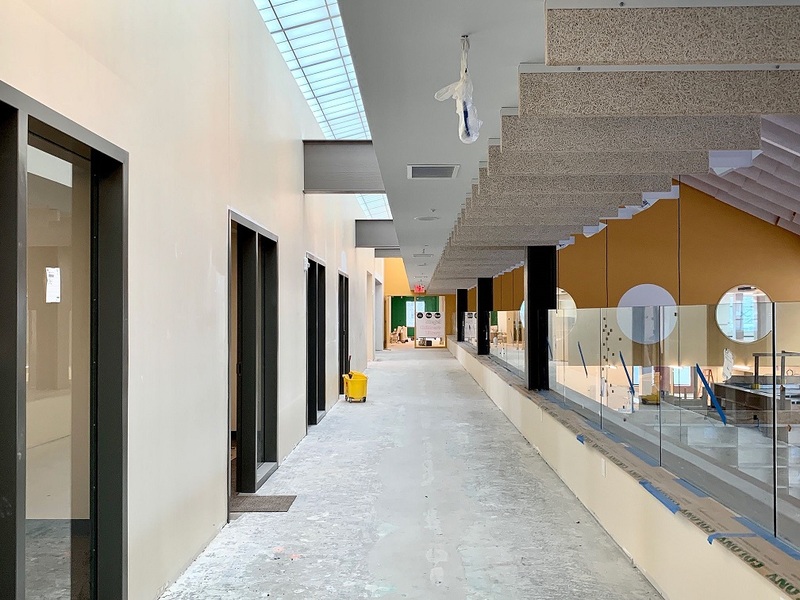 The downstairs level will be where most books are stored; a new entrance there will open up the river, improving the entire library experience for all. On Wednesday, the mural will be taken down. A group of Westporters — including Curran, Cummings and arts advocates — fears for what happens next. 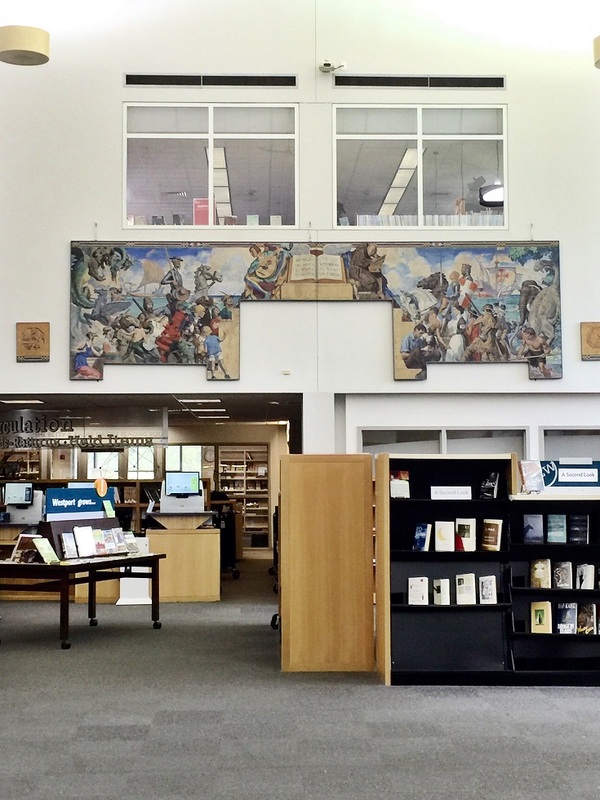 They worry that the library has no written plan for removing the mural from the wall. They don’t know where it will be stored, and how the tiles will be labeled so they can be replaced in the precise spots Grebow selected. And they haven’t gotten definite word on where it will be exhibited once the transformation is complete. 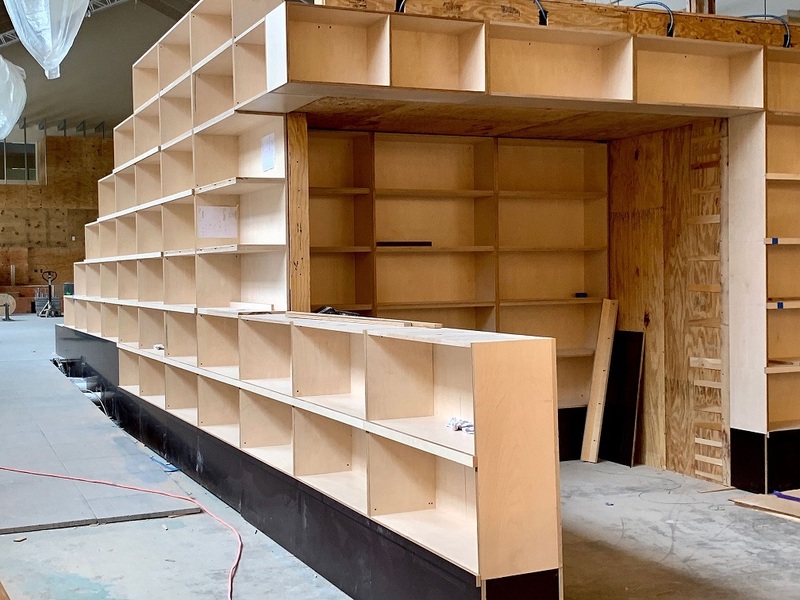 The Library has held discussions with Marion Grebow, individuals involved in the 1998 fundraising project, the original installer, and (as early as 2014) with 3rd-party fine art service firms on how best to de-install, pack, transport and store the wall. The priority has always been to protect the wall during construction. I am confident it will be professionally handled and stored until it can come back to the library. Meanwhile, mural advocates produced a video about the River of Names. At the end, Curran says: “Every day the tide goes in, and the tide goes out. But the river remains. 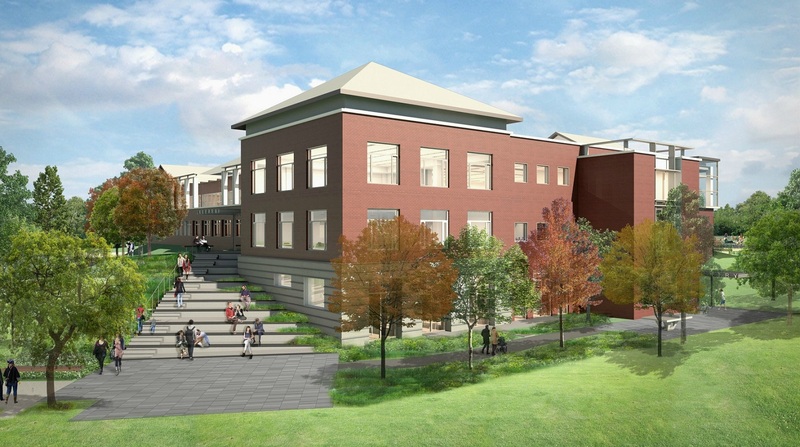 On August 1, the Westport Library breaks ground on a “transformation” project. Through 21 months of construction — during which it remains open for use — the 31-year-old building will be reimagined, top to bottom. 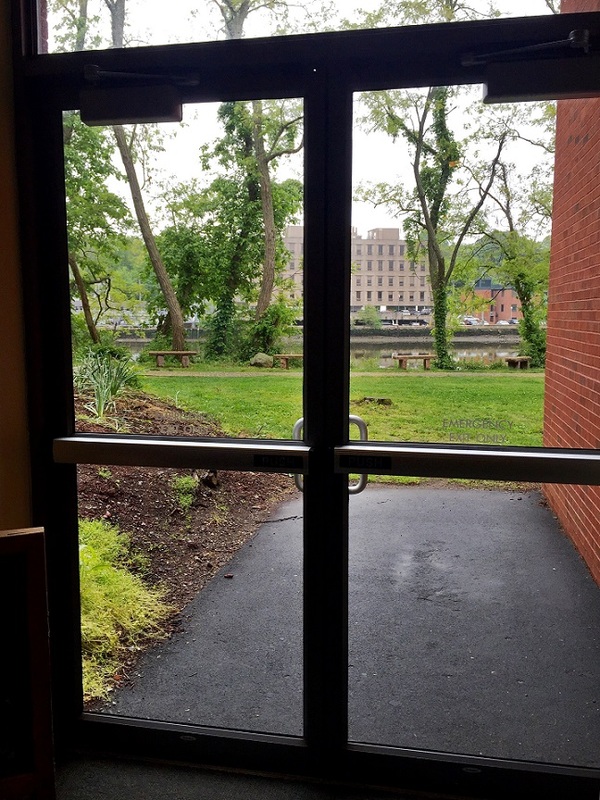 The stark and dark lower level — currently home to the video department, offices, the cramped McManus Room and a few offices — turns into a place of light, nature and activity. 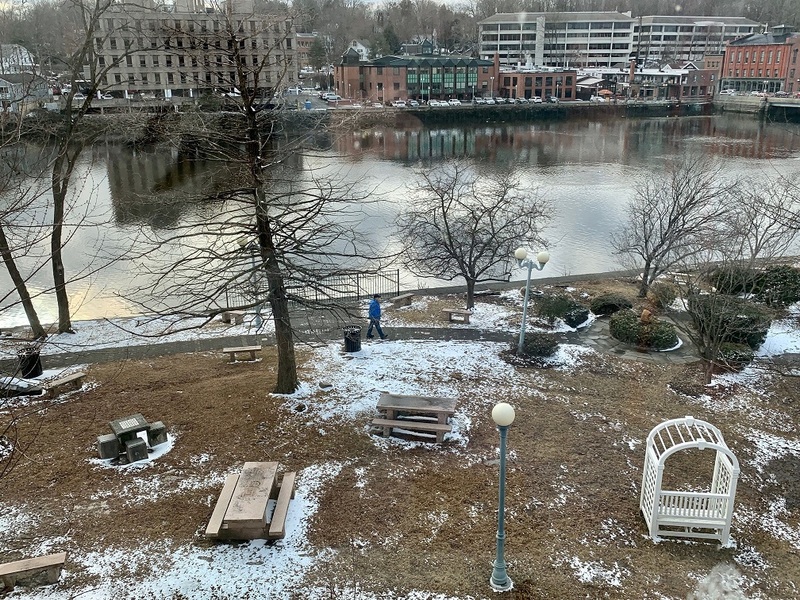 The offices facing the river will be recaptured for patrons’ use — with larger windows, to enjoy the view. The functional Taylor parking lot entrance becomes more welcoming. A 2nd entrance — midway up Jesup Green — offers another access to the main level. The result of all this is a better visual and visceral connection between the library, the river and the green. A rendering of the new Jesup Green entrance. 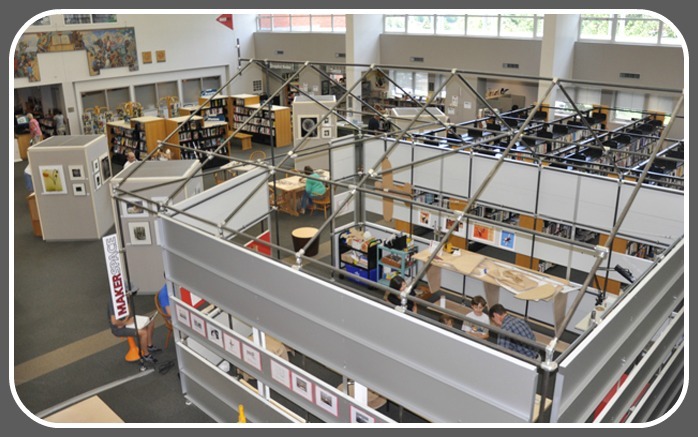 It will lead patrons into the upper level about where the graphic novels are located now. 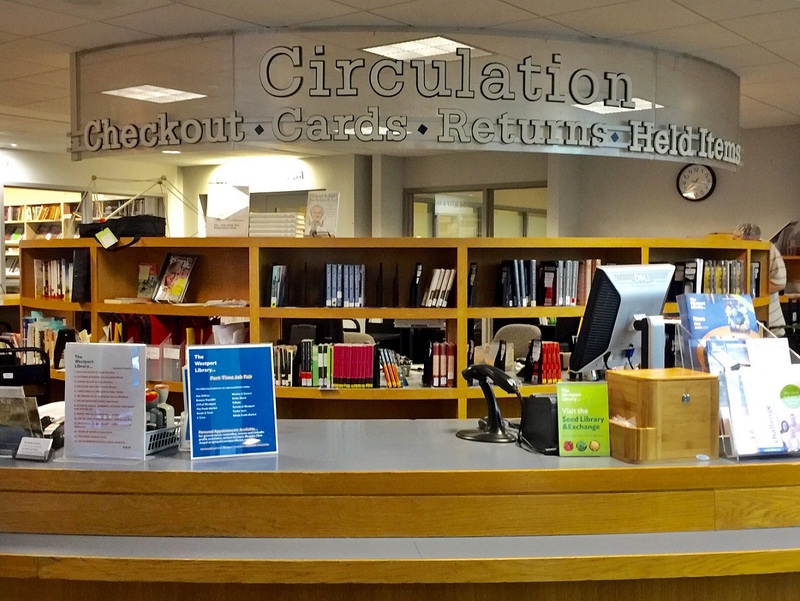 The DVD/BluRay collection — accounting for 35% of the library’s check-outs — moves to the main floor. So does the very popular McManus meeting room — where it will be 4 times larger. 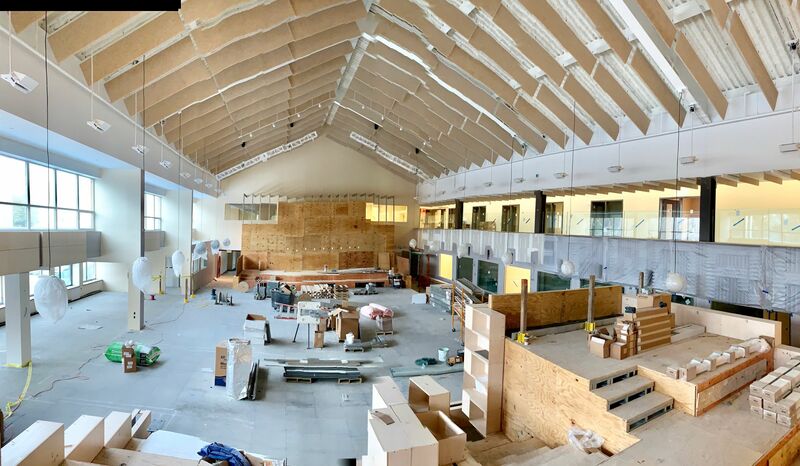 The main level — the one accessible now only from the Levitt Pavilion lot — undergoes a mind-boggling transformation. The cafe expands threefold. 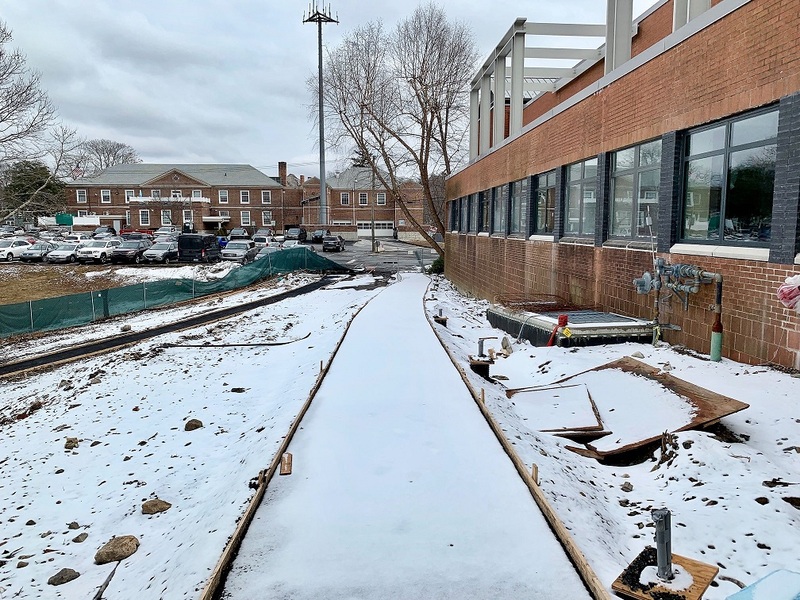 With more food choices, an outdoor terrace, a new connection to the Sheffer Reading Room and a special entrance allowing it to be used after hours for events like author and poetry readings, this area can become an actual destination. The newspaper and magazine reading rooms — with their gorgeous river views — remain. But mobile furniture makes them more flexible. The hulking service desk gets revamped, to be more open and inviting. Director Bill Harmer calls the area next to it “The Hub,” where staff members offer assistance. The main room gets acoustic tiles, helping noise and aesthetics. Dozens of power outlets will line the perimeter. A raised floor will be built over the art display kiosks (which are actually air intake vents, too costly to move). The grandstand will be similar to Times Square. Harmer envisions similar excitement, interaction, dreaming and activity. A giant LED screen and excellent sound system add to the possibilities. A rendering of the grandstand. 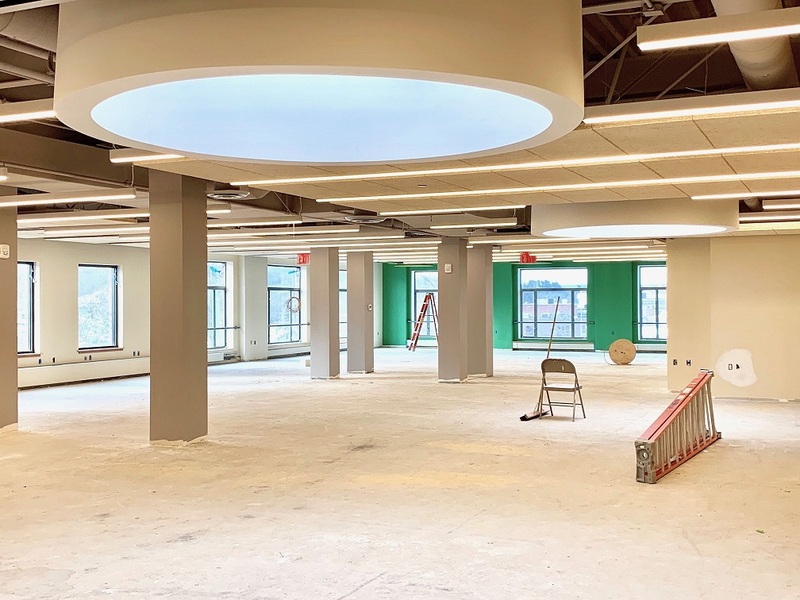 The current book stacks move one floor below, freeing up room for what Harmer calls “open, flexible community forum space.” With room for 500 people (and a large screen), it’s a spot for collaborative work, and large programs. A “forum” replaces stacks on the main floor. It’s a flexible space for collaboration and programs, with a large LED screen at the rear. This rendering shows the view toward the police station. The entire space can be cleared if needed, for exhibitions or trade-type shows. 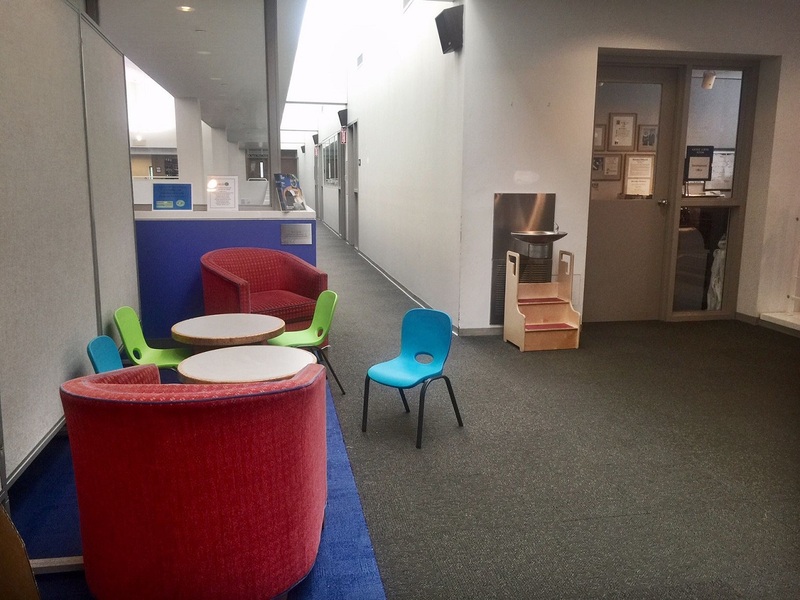 The Maker Space has already been disassembled, and reopened temporarily on the top floor. It will reappear — in a larger form — where the reference section, offices and computers are now. It too will have an after-hours entrance. 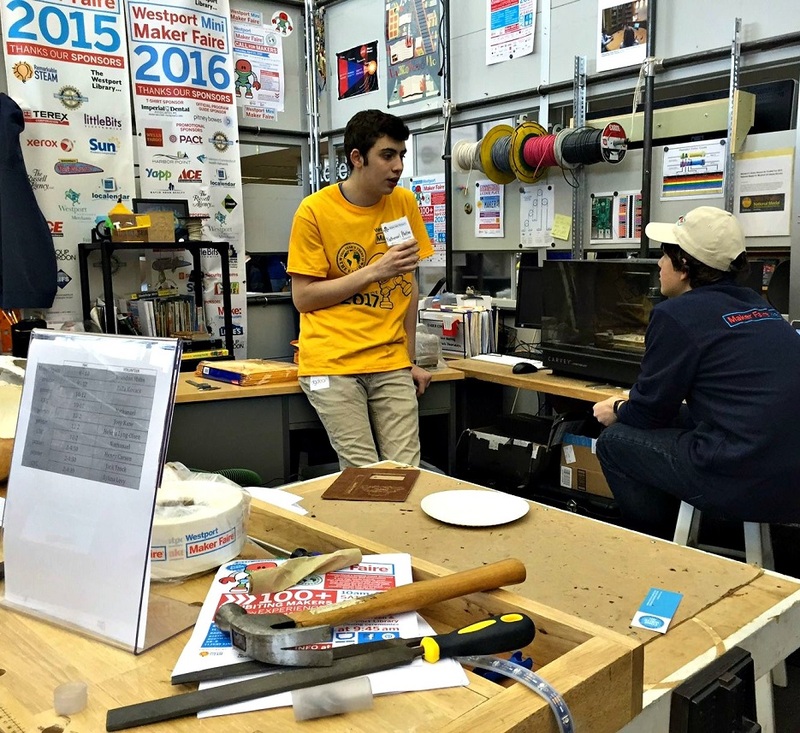 Harmer describes the new area as “community-oriented hacker space.” Laser cutters, lathes, power tools, sewing machines and kilns will allow for even more than tinkering, robotics, coding and 3D printing. No problem: It’s all sound-proofed. The old Maker Space has been disassembled. The new one will be even better. The nearby recording studio will be sound-proofed too. “It’s not Abbey Road,” Harmer apologizes. But — designed by Rob Fraboni, an audio engineer who has worked with the Rolling Stones, Bob Dylan, the Band, the Beach Boys, Eric Clapton and Joe Cocker — it will offer another immersive experience for patrons. Seven conference/study rooms — more than double the current 3 — will be loaded with technology. 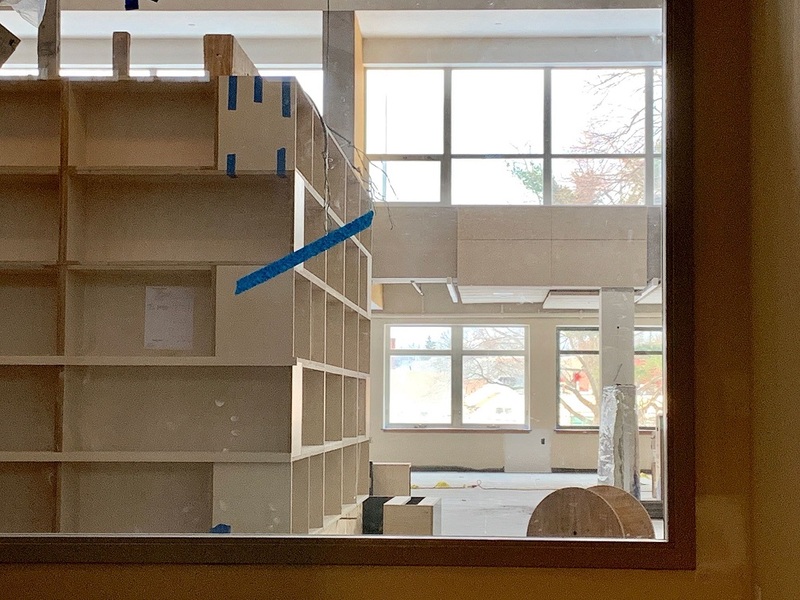 The new McManus Room is planned for the far end of the main floor — closest to the police station — where the stacks are now. 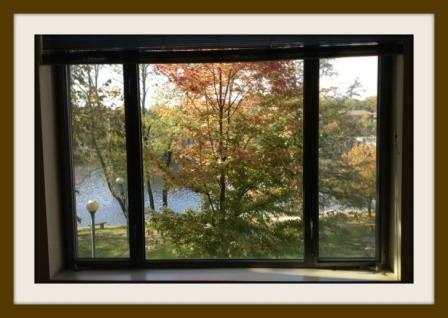 Windows will brighten that now-dark corner of the library. Upstairs, the balcony comes out another 5 feet. That provides “box seats” for all that goes on below, while easing the current hallway space crunch. The Children’s Department gets an extreme makeover too. More natural light, and a bit of reconfiguring of shelves, enlivens that important area. 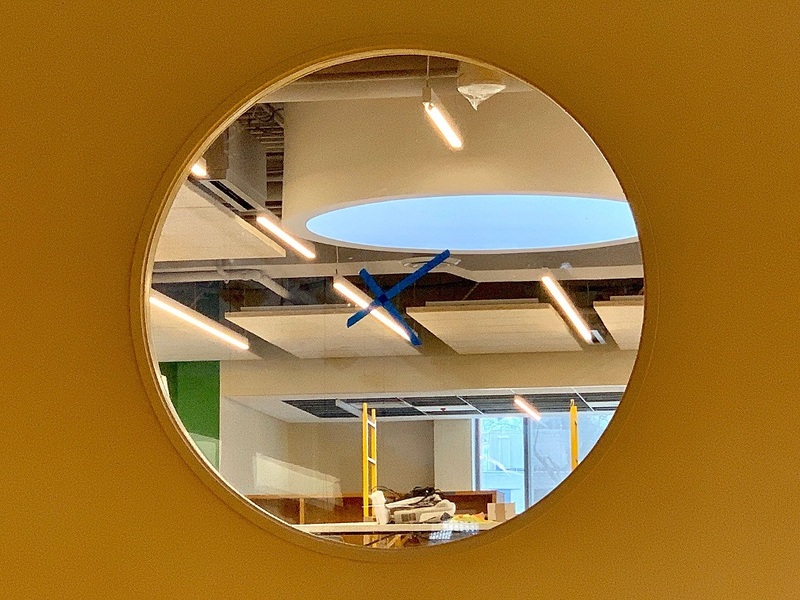 Giant porthole windows will enable kids to look out over the Great Hall. The price tag for all this is $19.5 million. The town of Westport provides a quarter of the funding. The other three-quarters comes from individual, foundation and corporate donations (including a $1 million state grant). 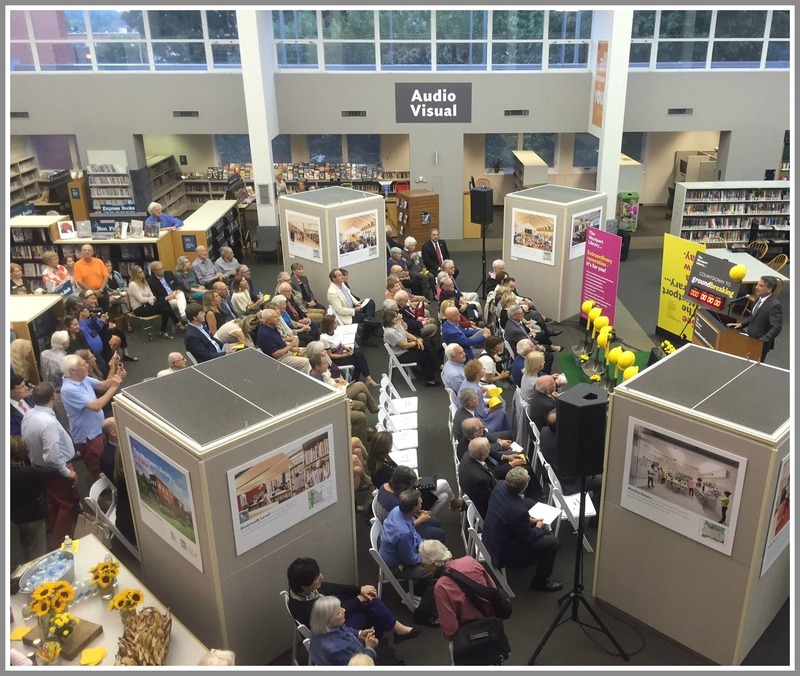 The library has raised all but $4 million of what’s needed. Bridge financing is already in place. 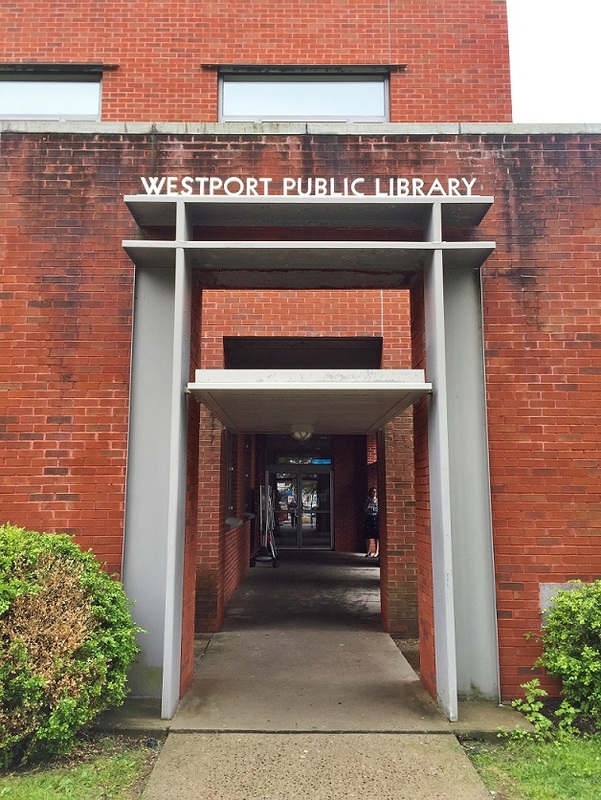 The Westport Library sits on some of Westport’s most beautiful — and valuable — real estate. It’s also one of our town’s most used — and valuable — resources. The project will transform more than the building, and Jesup Green around it. It will transform all of downtown. And all of us, too. For decades, Westporters have known Miggs Burroughs as a very talented, always-volunteering illustrator/graphic designer. 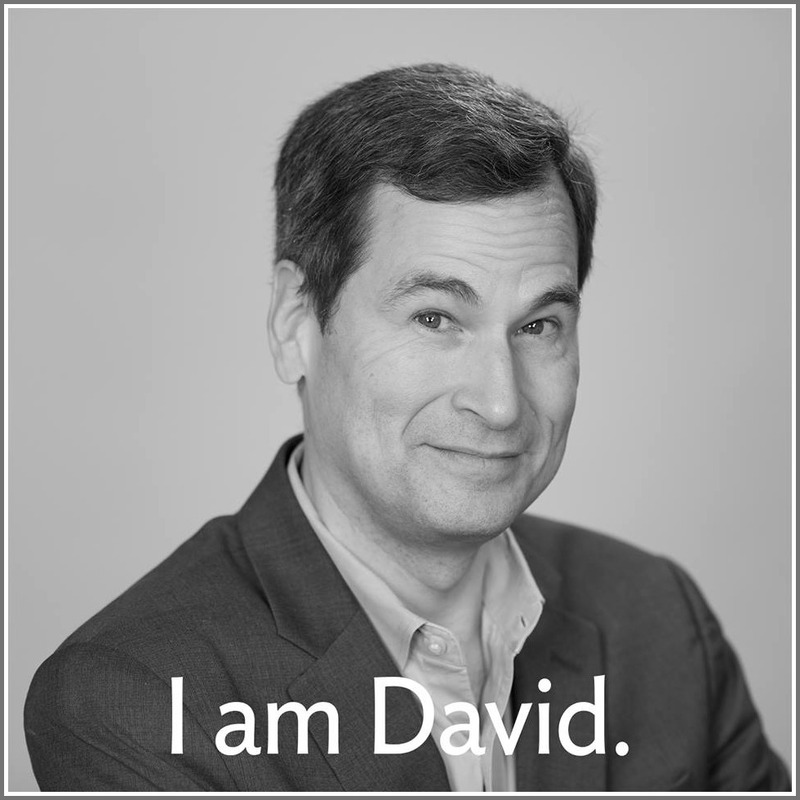 He’s created Time magazine covers, US postage stamps, logos for countless organizations and events (often pro bono) — even our town flag. 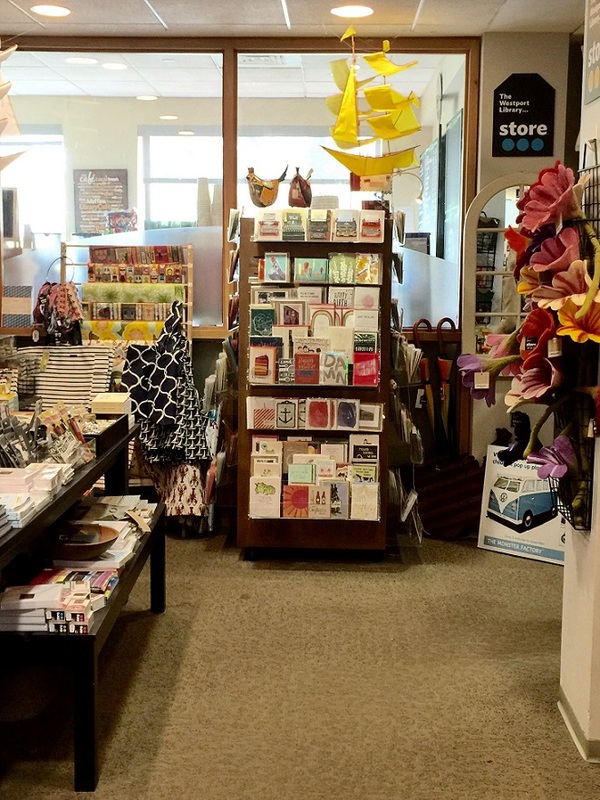 In July, Miggs adds a new title: Westport Library artist-in-residence. The Staples High School 1963 graduate’s latest role — the first-ever here, and one of the few at any library in the country — comes in conjunction with director Bill Harmer. And it’s a collaborative effort, both stress, with the entire town. 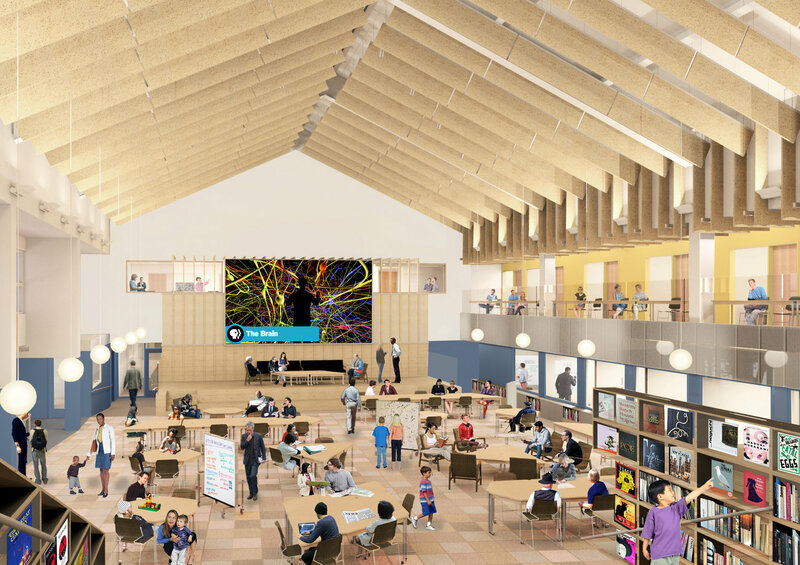 “We’re always looking for new ways to connect the library with the arts, and to strengthen existing artistic relationships and create new ones,” Bill says. 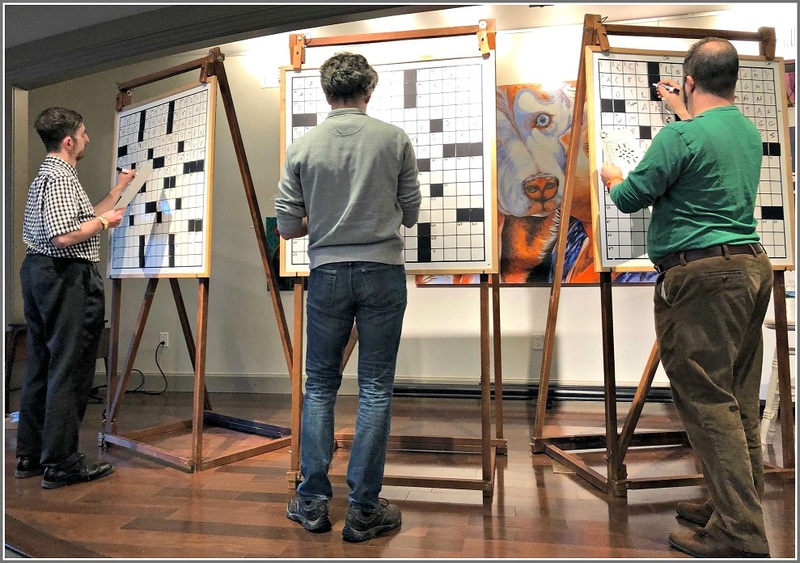 He joined the Westport Library last summer from Chelsea, Michigan, where he developed an artist-in-residence program. Like Westport, that town had a strong arts heritage. Offering workshops, events and programs in the library building — and pushing programs and services outside of it. And as with all things Miggs, the artist-in-residence-to-be has plenty of his own ideas. Some are out of the box. 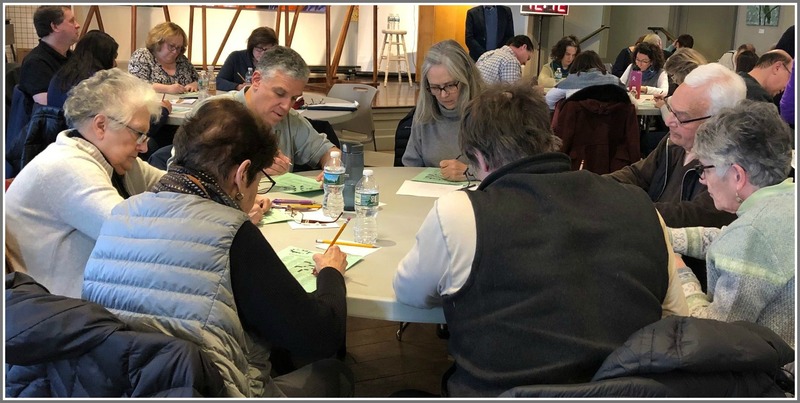 The Westport Library’s Makerspace is a spiritual cousin of the new artist-in-residence program. 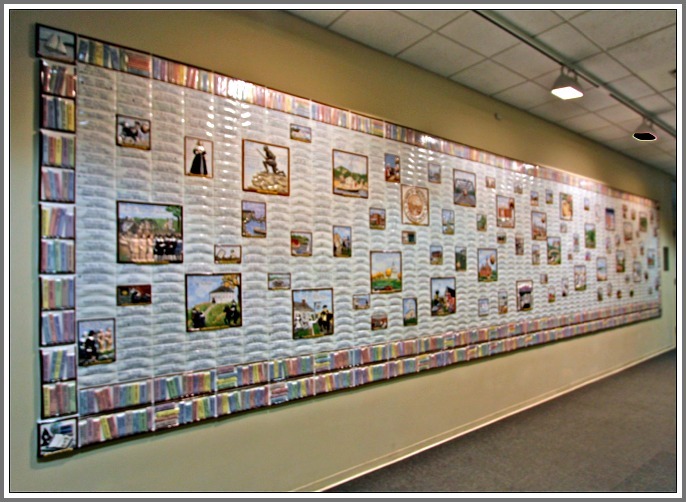 He envisions a wall of “photo tiles,” growing every day. Perhaps they’d be selfies, or faces that amateur photographers find in everyday objects. Or maybe shots of “A Day in the Life of Westport,” with everyone in town welcome to contribute. 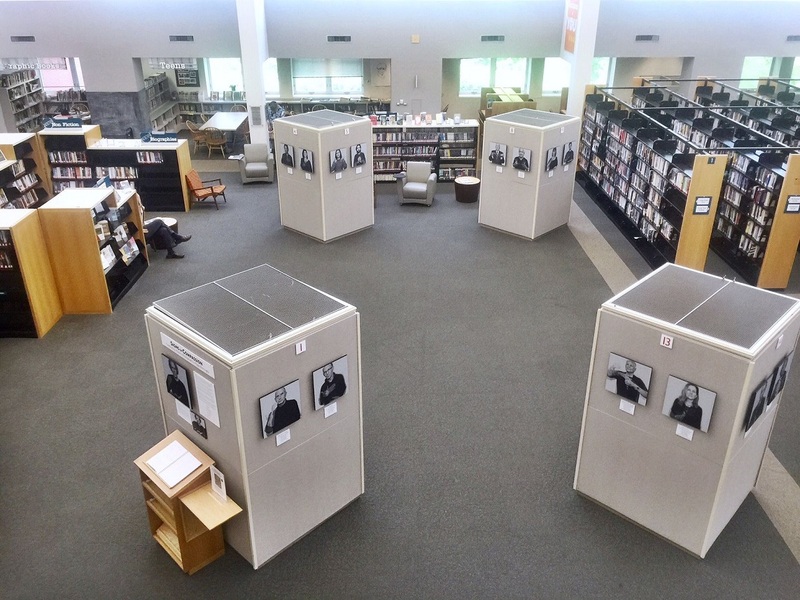 The library might play host to a Story Corps-type oral history project, or to pop-up studios enabling anyone wandering by to observe artists at work. 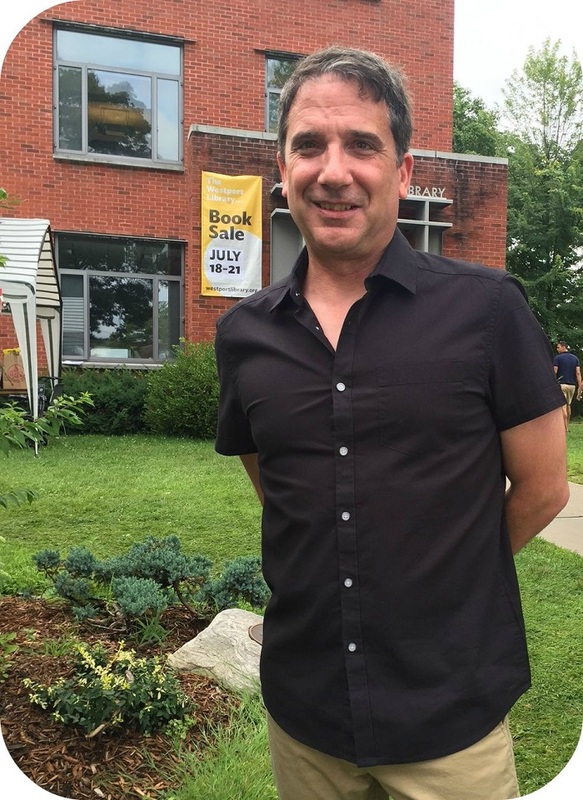 Whatever ideas he comes up with, Miggs says, the artist-in-residence program will work only if it’s a joint effort, with the library and town. 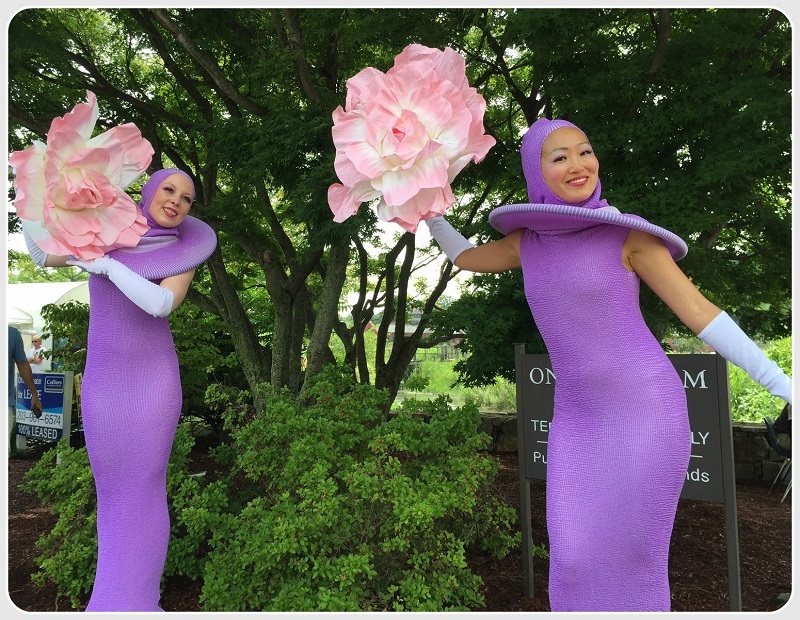 Our new artist-in-residence will not actually reside at the Westport Library. But his spirit — and that of all the arts in town — will be felt in every inch of the building. In one of his first library jobs, he met a mother and daughter. The younger woman had just been diagnosed with a very serious cancer. Day after day, Harmer helped them research the disease and treatment options. One day, they brought flowers. “You’ve done more for us than our doctors have,” they said. The librarian has been “called” to a new position. 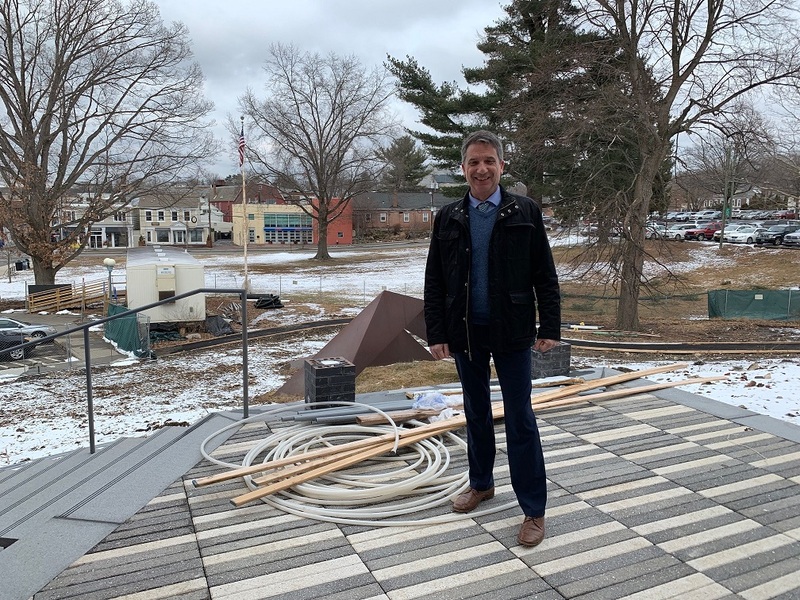 Last month, he became executive director of the Westport Library. Bill Harmer, in his new digs. Maxine Bleiweis is a very tough act to follow. But with passion, energy, creativity and a community-minded sense of purpose, Harmer seems poised to pick up exactly where she left off. 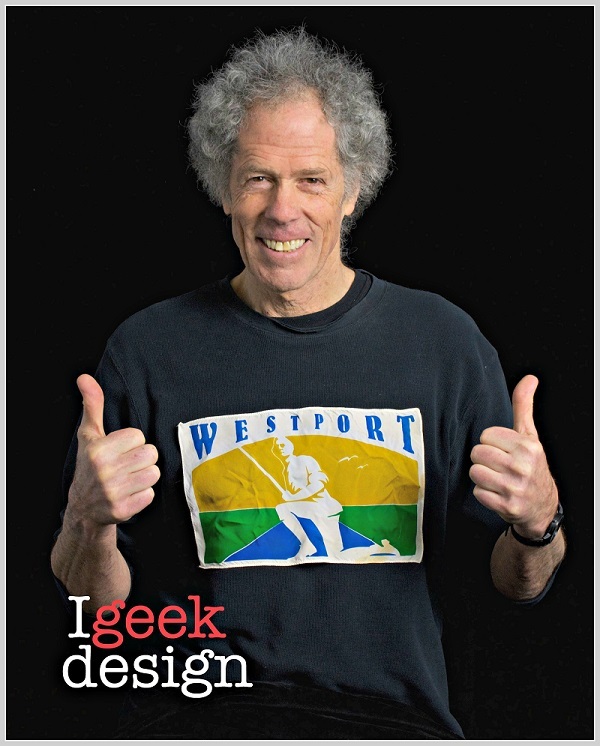 His path to Westport was “meandering,” he says. 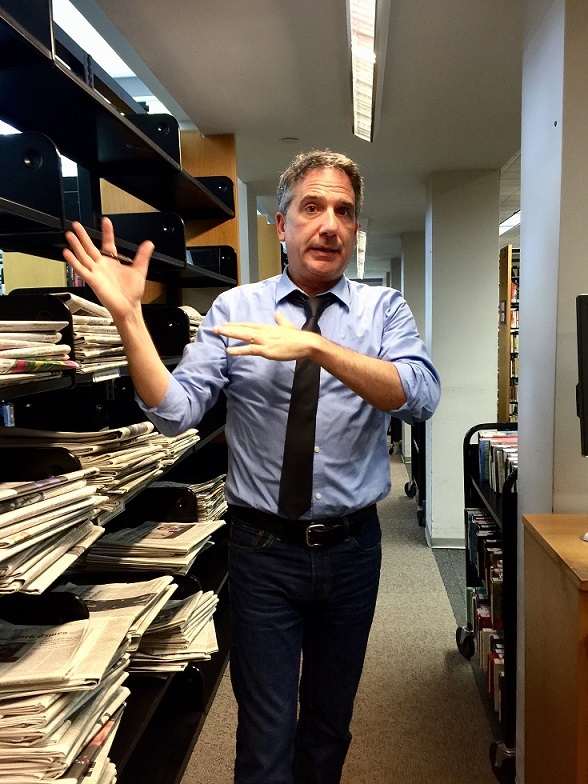 “I wandered in the forest of journalism and publishing.” His experience with libraries had been limited to “checking out books.” But the publishing job introduced him to reference sections, and the company paid for his graduate degree in library and information science. He spent the past 9 years at the Chelsea District Library in Michigan, near Ann Arbor. His achievements included moving a rural library into a 30,000-square foot, state-of-the-art downtown building. 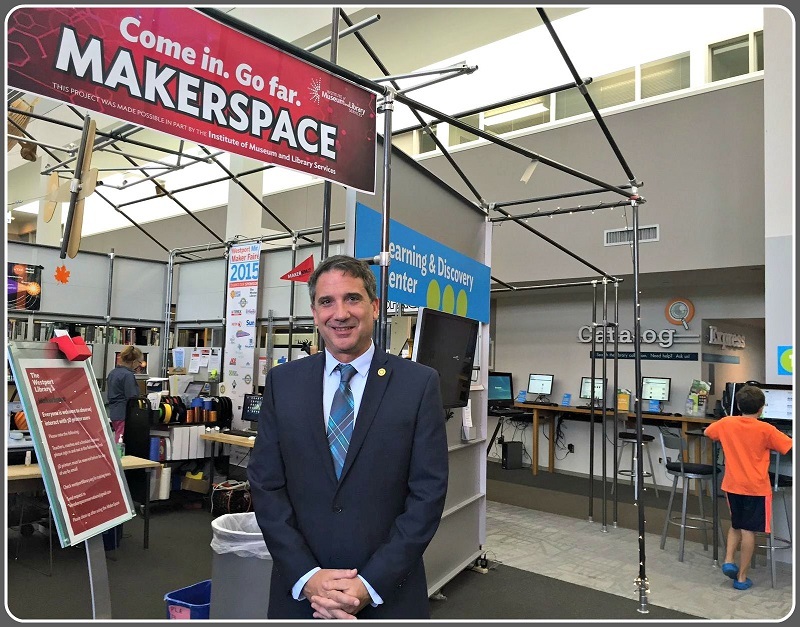 He quadrupled his budget and staff, and turned the library into a beloved community asset. He put the library on sound financial footing, during tough times. A millage increase passed by a landslide — just a few years after the bond issue to build the new library had squeaked by. Harmer loved Chelsea, and his very innovative library. And Chelsea loved him. But when he saw a posting for the Westport job, he was intrigued. Harmer felt a “kinship” with this library’s vision and philosophy. He already knew about the Maker Space. 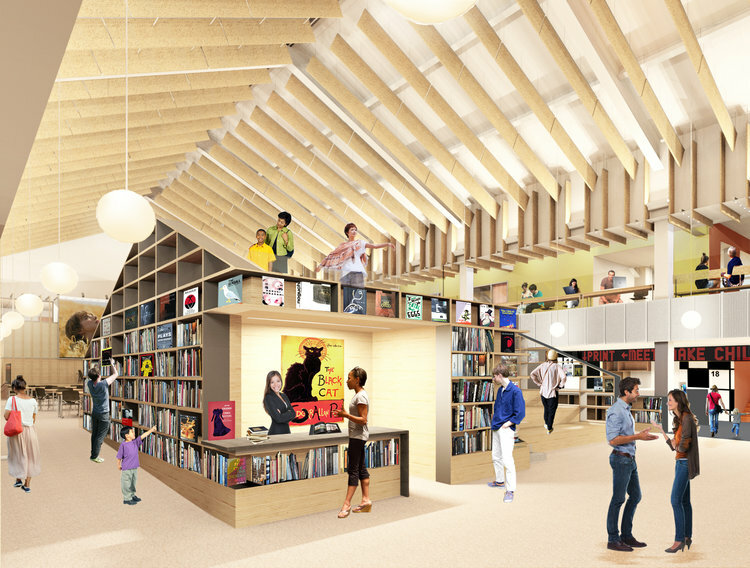 The proposed transformation of the library for the 21st century was truly exciting. 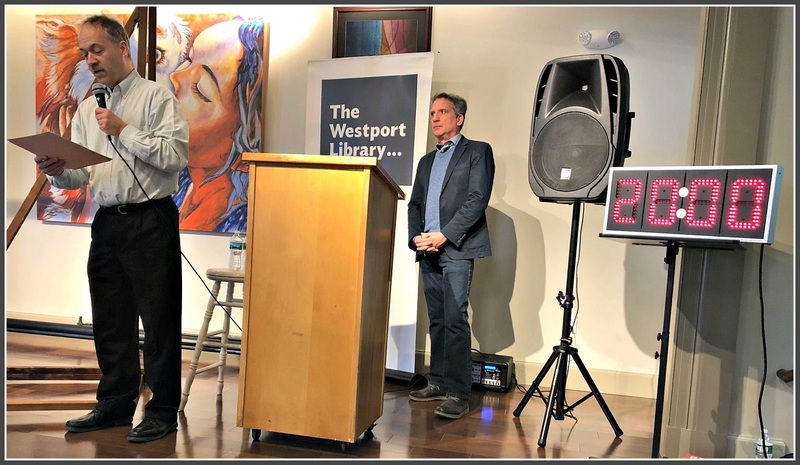 The Westport Library provides a warm home for all. 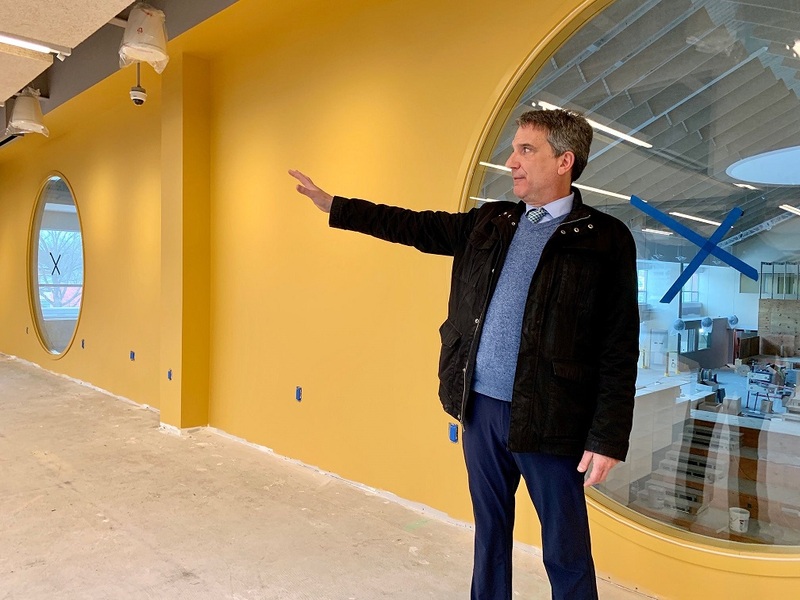 He’s spending his first weeks getting the lay of the land: talking personally with employees and patrons, learning the budget, figuring next steps for the Maker Space. He’s also immersing himself in Westport. He’s meeting with Rotary clubs. Miggs Burroughs gave him a “Tunnel Vision” tour. Jeff Wieser showed off the Gillespie Center. “I love what it does, and that it’s right across the street from us,” Harmer says. He’s made plans for his staff to prepare and serve a meal there. Harmer is learning about the Y, Senior Center, Chamber of Commerce, Downtown Merchants Association and Arts Center. He hopes to collaborate with town organizations as much as possible. Bill Harmer arrived in Westport in time for the summer Book Sale. Every move — career and personal — is filled with challenges. Was there one moment when Harmer realized that — despite those challenges — he’d made a good decision to come here? It came quickly, he says. 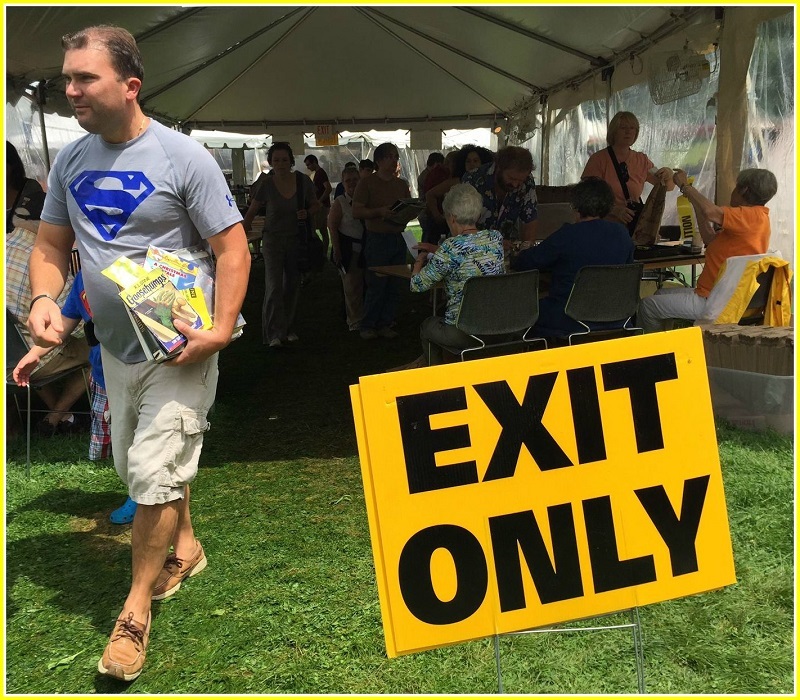 He decided to come a week before his official start date, to see what the huge Summer Book Sale was all about. An easy 2-day, 2-car drive east with his wife and 3 children ended with a horrendous, Friday traffic jam on I-95. That evening coincided with the library staff’s annual Compo cookout. After 2 hours of gridlock, the family’s nerves were frayed. Just to be social, they headed to the beach. “Before we set foot on the sand, a dozen staff members swept in,” Harmer says with awe. “They fed us, gave us a warm welcome, and made us feel part of their family. 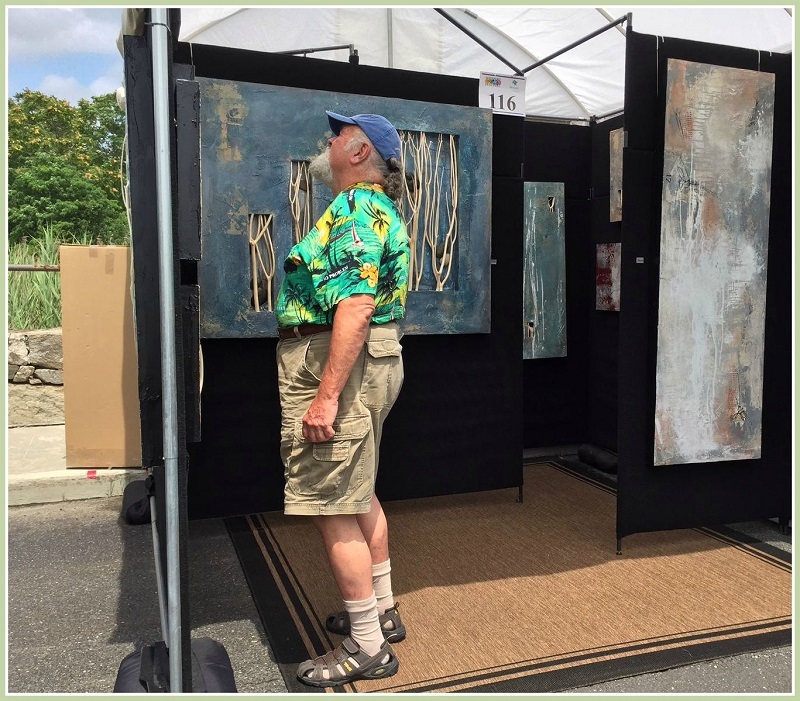 It’s a beloved tradition: In mid-July, the Westport Downtown Merchants Association hosts a Fine Arts Festival on Parker Harding Plaza and Gorham Island. 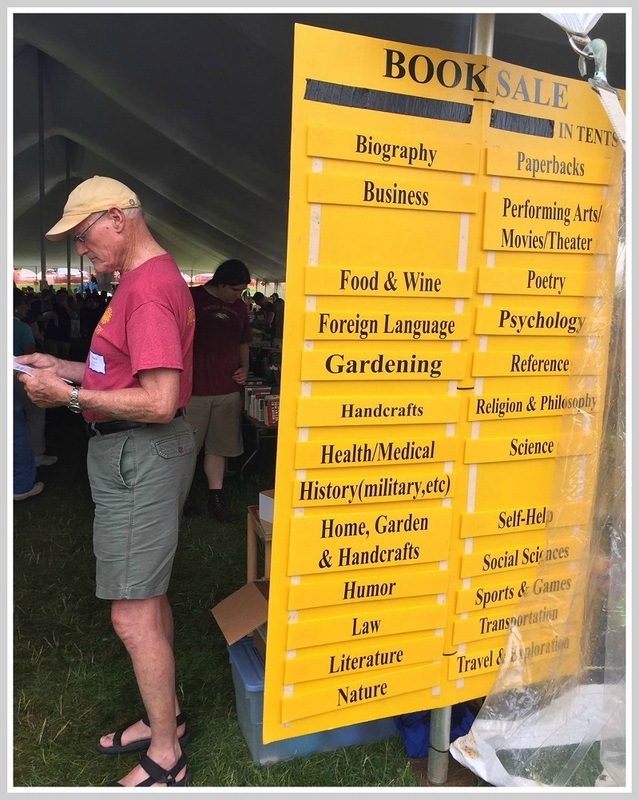 Across the Post Road, the Westport Library fills a jinormous tent with over 80,000 items, for its annual books (and much more) sale. Part of the tradition: It’s always held on the hottest day of the year. Today marks a nice break from that tradition. Rain did not keep 300 folks from lining up before the book sale opened. Every artist, sculptor and photographer was good to go too. By mid-afternoon the clouds lifted. 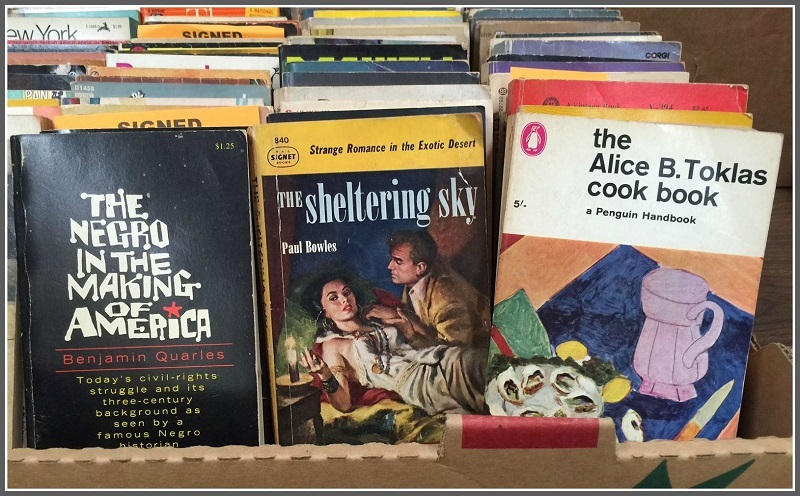 Over 3,000 books-and-more lovers hauled boxes and bags to their cars. A similar number strolled along the river, admiring (and buying) artwork. 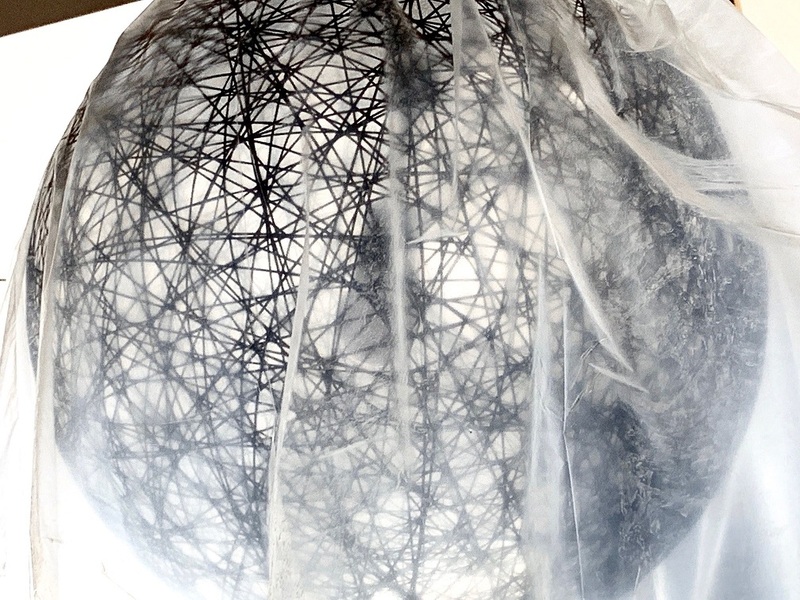 The 42nd annual Fine Arts Festival continues tomorrow (Sunday, July 19) 10 a.m.-5 p.m.. The “Bookstravaganza” continues tomorrow and Monday (July 19-20), 9 a.m.-6 p.m. 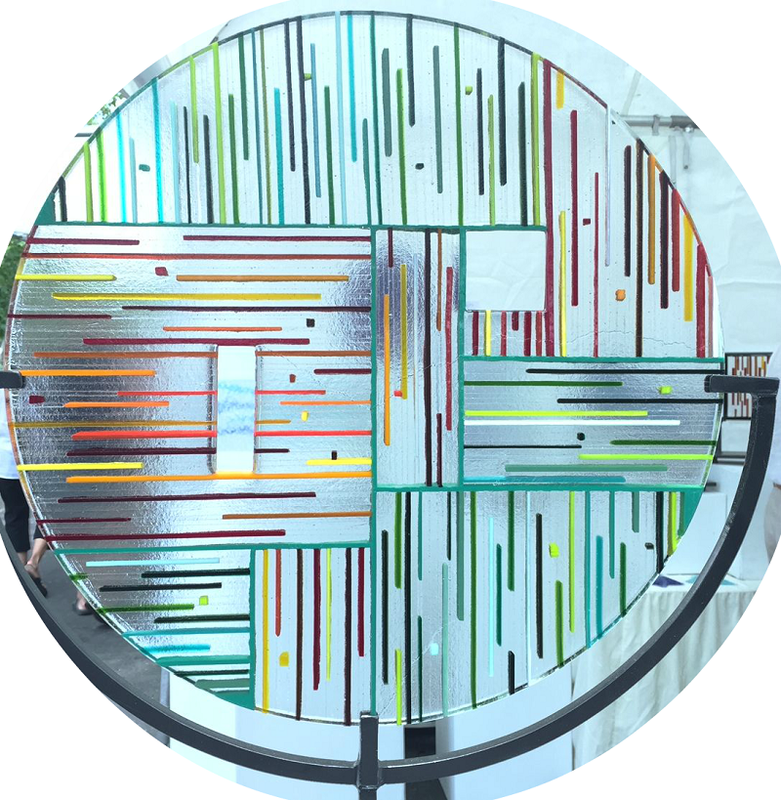 It ends Tuesday (July 21), 9 a.m.-1 p.m.
…and this piece of glass. Parker Harding Plaza is a great location for the art show. The river provides a welcoming backdrop — and permanent art lines the walkway. Living art was on display too this afternoon. Noted art patrons Bill Scheffler and Ann Sheffer enjoyed the show today, with Ann’s daughter Betty Stolpen (she works at the Whitney Museum) and her friend Matt Glick. 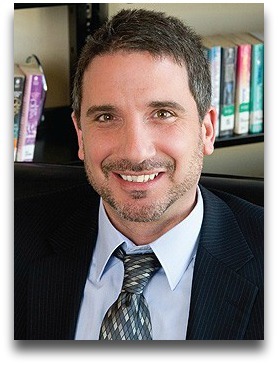 New library director Bill Harmer does not officially begin until July 27. But he was at the book sale today, checking out the legendary event. One satisfied customer, among thousands. 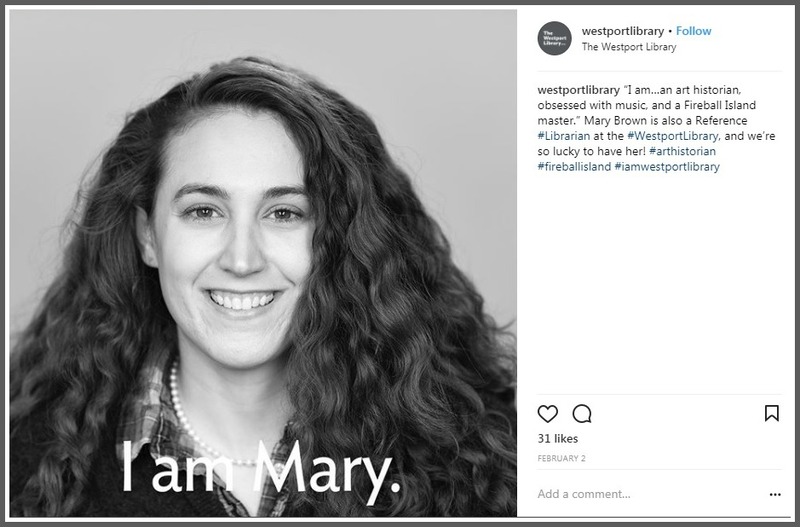 As sad as Westport is to see Maxine Bleiweis go — and we are very sad — we’re not the only town sorry to lose its library director. 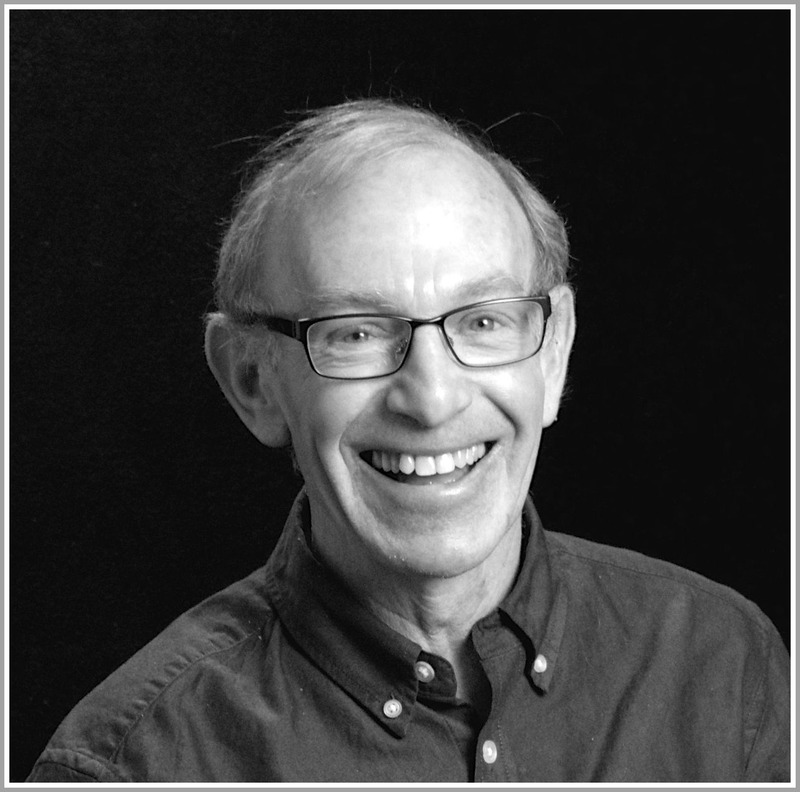 The Chelsea District Library bids farewell to Bill Harmer. And throughout Michigan, the tributes are pouring in. Well, Chelsea’s loss is Westport’s gain. All those plaudits are for the Westport Library’s new director. Harmer takes over from Bleiweis on July 27. Sounds like we’ve got ourselves another world-class winner.